Julian was born and raised in Las Vegas, and he became an EMT in 2009. 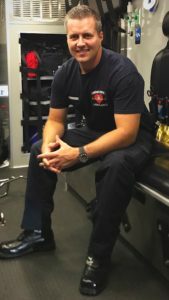 He then moved to Rhode Island, where he served as a volunteer firefighter/EMT for three years with Jamestown Rhode Island Fire Department, and he became a Paramedic in 2015. In 2016, Julian returned to Las Vegas and joined Community Ambulance. Community Ambulance was the company contracted to provide medical services at the Route 91 Harvest Music Festival, and after the October 1st attack last year, Julian and his partner, Edgar Bibiano, were dispatched to get the injured to the hospital. Julian and Edgar were one of the first units to arrive outside the venue’s main medical tent, and without hesitation, they began making room for as many patients as they could. During their first trip to the hospital, they transported seven patients at once, including a female who was shot in the neck and another who was shot in the neck twice; a male who was shot in the spine and showed signs of paralysis; a female with a gunshot to her head; a female shot three times in the chest; a female shot in the leg; and a man who had been shot in the abdomen. They returned to the incident two more times to transport additional patients. Julian’s determination and bravery helped to save countless lives that night. In his free time, Julian enjoys aviation and travel, along with watching various sports, including hockey, baseball, and football.